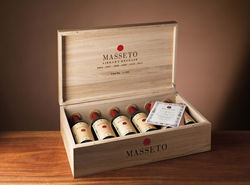 Masseto, Italy’s most collectable single vineyard wine, is proud to announce the launch of its first ever library release as part of Christie’s 250th-anniversary celebrations globally, and 30th anniversary in Hong Kong. Considered one of the world’s greatest wines and acknowledged as a very sound investment by the Liv-Ex auction index, this rare Masseto Library Release will be unveiled as a feature lot in Christie’s Hong Kong Finest and Rarest Wines Sale on May 27, 2016. The lot will feature rare bottlings (6 x 750ml) from vintages 2006-2011, which are packaged in a custom made 6 bottle wooden case. Only 100 of these cases have been produced and each case is numbered. This case is numbered 1/100. The lot also includes a private visit, lunch and tour of the Estate for six people. Proceeds from the auction will benefit the French Red Cross, the exclusive charity partner for the event. As with regular bottlings of Masseto, this Library Release will come equipped with the Prooftag™ technology on the neck of each bottle, guaranteeing authenticity and provenance. Collectors who miss out on the opportunity of securing case number 1/100 at the Christie’s Hong Kong Auction Sale may have the rare opportunity to find Masseto Library Release following its extremely limited release in October 2016 to highly selected prestige accounts worldwide. Masseto is a unique place and a unique wine. At the top of the Masseto hill, at an elevation of about 120 meters above sea level, the soils consist of loose clays and sand with many pebbles, a composition blessed with the capacity to give wine elegance (‘Masseto Alto’). In the central part (‘Masseto Centrale’), unique grey Pliocene clays predominate, giving the wine its backbone and structure. The lower part of the vineyard (‘Masseto Junior’) grows on less clayey soils giving the wine its breadth, softness, and generosity. In each of these three zones there are small areas that ripen differently and are harvested at different times. Only later will these different vineyard blocks be blended together. Masseto has received international acclaim since its birth in 1986.